Code Inside Blog | Use Twitter Login in ASP.NET MVC 4 without membership & co.
Use Twitter Login in ASP.NET MVC 4 without membership & co.
I’ve already blogged about the authentication with Twitter. ASP.NET MVC 4 offers the DotNetOpenAuth NuGet package which makes the pure authentication process a lot easier. 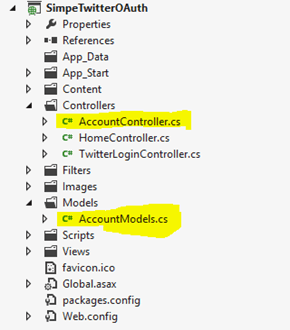 If you are going to create an ordinary MVC 4 WebApp you will find an “AccountController” and several classes in “AccountModels.cs”. I have to admit that I was very disappointed with the whole Membership System some years ago and because of that I didn’t plan to invest more time into it. Indeed they offer SimpleMambership & co ut to me it doesn’t seem “simple” and because I prefer to stay in charge of the information’s I sense this Membership System as a kind of paternalism. Besides I refuse to save the Login-files into an SQL server but in RavenDB or my own formats. With ASP.NET MVC the DotNetOpenAuth NuGet package will be installed automatically and it offers several providers. It’s possible to contact this straight without the WebSecurity or Membership stuff from ASP.NET. I’ve mentioned how to find the Twitter Keys here. Besides there are several helps on the Twitter Dev Site. Publish on Twitter with the TwitterClient? 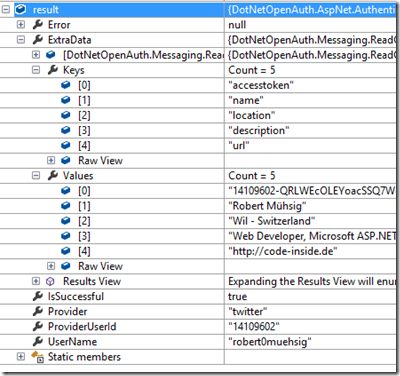 Keep in mind: the only task of the TwitterClient in the DotNetOpenAuth project is the authentication. If you want to get the authentication and post Tweets you should take a look on the DotNetOpenAuth ApplicationBlock package on NuGet. Keyword is “TwitterConsumer” and the implementation of own Stores for the Keys.